The Gordon Brothers Team is a real estate company based in Pickering, ON. Brothers Doug and Rich Gordon are sales representatives with ReMax First Realty. 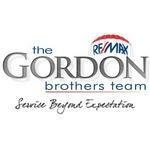 The Gordon Brothers Team serve the Durham Region. Products Carried: The Gordon Brothers Team represent buyers and sellers in their real estate transactions. Located in Pickering, Ontario, brothers Doug and Rich Gordon are with ReMax First Realty. They help their clients with the buying and selling of homes in the Durham Region, including Ajax Homes, Pickering Homes, and Whitby Homes.